Loamy soil--a mixture of sand, silt and clay--provides ideal nutrition for wheat, a grass that has become a staple in most diets around the world. The fertile, well-draining soil mixture of sand, silt and clay allows for rapid absorption of water and air by plant roots, which encourages growth. 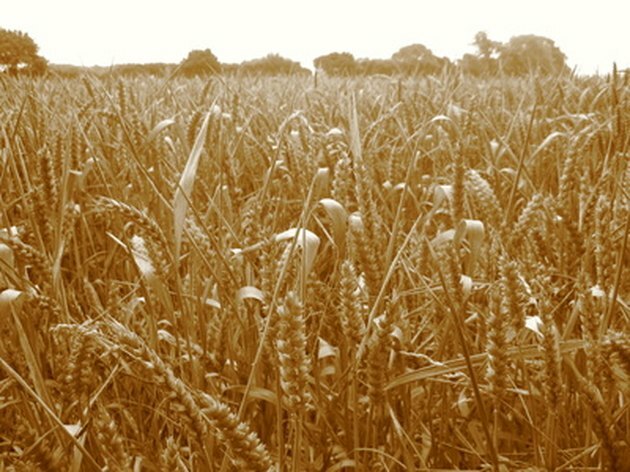 Loamy soil, a mixture of sand, silt and clay, provides the best growing environment for wheat. Loamy soils are made up of about 40 percent sand, 40 percent silt and 20 percent clay. That combination holds enough water for the plant to take in nutrients but also drains well to allow air to reach plant roots, making the soil type ideal for most garden plants, according to Purdue University's Department of Horticulture and Landscape Architecture. Variations include sandy loam, with a higher concentration of sand particles, and loamy sand, with more silt, according to North Dakota State University. Wheat is grown in soils ranging from sandy to clay-packed, but does best in a loamy mixture that is found across the midwestern United States and Canada. Soil is made up of many particles of different sizes and characteristics. The three major soil groups are sand, silt and clay. Sand, the largest particles of the three types, allows water to drain through instead of holding it, making it a critical component for ensuring water and air reach wheat's roots, bringing needed nutrients, according to Purdue University. At the other extreme, clay particles are the smallest and pack together so that water has difficulty penetrating or draining through it. Silt is made up of medium-sized particles that have some draining and some compacting characteristics. A blend of the three soil types ensures a balance between water retention and draining. Soil stores and transports water and air, and thus nutrients, for plant roots to absorb to encourage growth in the plant above ground. Water is stored in soil as a coating on soil particles and in the voids between the particles, an area known as "pore space," according to North Dakota State University. Loamy soil, with its mix of soil particle types and sizes, contains pore space of various sizes that allows water to seep through the soil to the root zone. How much water clings to the soil is the most important soil characteristic for growing plants, including wheat, according to North Dakota State University. Loamy soils provide optimal water storage between the extremes of saturation and so dry that plants wilt. Well-draining loamy soils also allow for better dispersal of salts that build up in soils and, at high quantities, reduce a plant's ability to extract water and nutrients. Loamy soils, with their balanced, stable mix of sand, silt and clay, have plenty of soil pores that allow wheat roots to move easily through the soil with a rapid absorption of water and air that encourages growth, according to North Dakota State University. Five properties determine soil formation: the type of original material such as rocks, topography, plants and animals in the area, and time, according to North Dakota State University. The United States Department of Agriculture lists six categories of soil, each broken down into groups based on their properties.